Pelican Landing is an active lifestyle community located in Bonita Springs, Florida. Bordered by Spring Creek on the south and the aquatic preserve Estero Bay on the west, homes in this premier community offer breathtaking water and nature views. Thanks to careful planning and preservation efforts, Pelican Landing's landscape remains pristine. Pelican Landing residents have a smorgasbord of opportunities to remain active and engaged within the community including a butterfly garden, tennis center, and Beach Park. The community of Pelican Landing in Bonita Springs strives to preserve, enhance and protect the natural environment. An integral part of the community's design are live oaks, slash pines, cypress hammocks, wild palmettos and Florida's state tree the sabal palm, as well as preserved wetland areas. Pelican Landing homeowners are encouraged to build landscapes harmonious with nature by planting native plants whenever possible. Amenities in Pelican Landing are abundant. The 14,900 square-foot community center features a fitness and an aerobics center, multiple meeting and activity rooms as well as outdoor bocce courts and a resort-style pool. Also in the community is the Pelican Landing Tennis Center featuring 18 lighted tennis courts. The community also offers a fleet of sunfish for sailing in Estero Bay, as well as sailing lessons. Canoe and kayak rentals are also available and group paddle sessions are held on a regular basis. These adventures are led by an experienced paddler, and the sessions allow residents to enjoy the outdoor experience and meet new people. The popular Pelican's Nest Golf Club is located within the community of Pelican Landing. The challenging course features picturesque views and a 45,000 square-foot clubhouse, including the Thirsty Pelican Grill Room that offers breathtaking views of Spring Creek. The Beach Park is another great amenity found in Pelican Landing. Residents can enjoy the beach and have access to the beach house that comes equipped with shower facilities and an outdoor patio. The Beach Park also has two bocce ball courts, two picnic pavilions, and a nature library. Since its inception in 1985, the community of Pelican Landing has grown to include 3,068 residences. 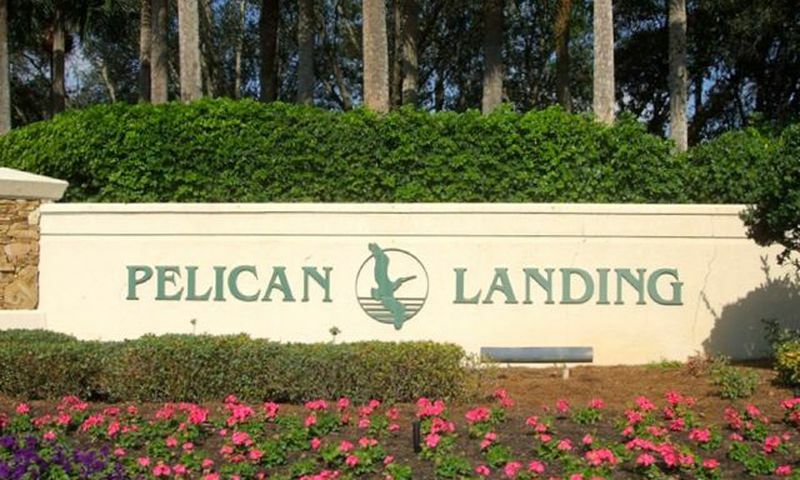 Pelican Landing consists of single-family homes, coach homes, villas, garden condominiums, and high-rise condominiums. Features included in homes run the gamut, from sunrooms with private pools, to breathtaking views of the water, to gourmet kitchens and sprawling master suites. Condos are available in high-rise buildings with units ranging in size from 1,300 to over 2,000 square feet. Many of these units have golf course or water views. Garden condos are two-story buildings that typically have a single-car garage. Offering up to 1,800 square feet with three bedrooms and 2 bathrooms. Coach homes are two-story buildings that offer a one or two-car garage. These model are two and three bedroom plans ranging in size from 1,300 to 1,800 square feet. Detached Villas offer single-level living with a two-car garage. These homes offer a maintenance free lifestyle with a single-family feel. The single-family models offer three to six bedrooms and up to four baths. Most homes enjoy golf, water, or preserve views. The lifestyle at Pelican Landing is vibrant and exciting with something for just about everyone. There are plenty of clubs and activities in the community including those that highlight art, birding, books, bridge, cycling, fishing, gardening, the single life and nature photography. Community service oriented residents can choose to donate their time to various charitable organizations outside of the community. A Pelican Landing lifestyle director is also on hand to help residents with scheduling activities and social events. Right outside the community of Pelican Landing in Bonita Springs, there are many opportunities for shopping, dining and worship. Only a few miles from the beautiful beaches of the Gulf of Mexico residents enjoy frequent trips to the beach. Further away in Fort Myers, residents can take a day trip to visit destinations such as the Art of Olympians Museum & Gallery, the community s historic downtown waterfront area and the Murphy-Burroughs House, which is on the U.S. National Register of Historic Places and offers weekly tours. Pelican Landing offers a variety of amenities and social activities that's perfect for homebuyer looking to live in Bonita Springs, Florida. Community Center - 14,900 Sq. Ft. The Pelican Landing Tennis Center is one of the best tennis facilities in the Naples area. These courts are open for use by all residents. Residents of Pelican Landing have the opportunity to join the Pelican's Nest Golf Club. Both social and golf memberships are available. Clubhouse - 45,000 Sq. Ft. There are plenty of activities available in Pelican Landing. Here is a sample of some of the clubs, activities and classes offered here. Condos are available in high-rise buildings with units ranging in size from 1,300 to over 2,000 square feet. Many of these units have golf course or water views. Please Note: Floor plans are not available at this time. Garden condos are two-story buildings that typically have a single-car garage. Offering up to 1,800 square feet with three bedrooms and 2 bathrooms. Please Note: Floor plans are not available at this time. Coach homes are two-story buildings that offer a one or two-car garage. These model are two and three bedroom plans ranging in size from 1,300 to 1,800 square feet. Please Note: Floor plans are not available at this time. Detached Villas offer single-level living with a two-car garage. These homes offer a maintenance free lifestyle with a single-family feel. Please Note: Floor plans are not available at this time. The single-family models offer three to six bedrooms and up to four baths. Most homes enjoy golf, water, or preserve views. Please Note: Floor plans are not available at this time. We choose Pelican Landing for many reasons but we especially love the waterfront views and features you can only find close to the water like the beaches, kayaking, fishing and sailing. Being near the water is a must for us so this community fit the bill perfect for our retirement. If you have to be on the water you have to look at Pelican Landing! 55places.com is not affiliated with the developer(s) or homeowners association of Pelican Landing. The information you submit is distributed to a 55places.com Partner Agent, who is a licensed real estate agent. The information regarding Pelican Landing has not been verified or approved by the developer or homeowners association. Please verify all information prior to purchasing. 55places.com is not responsible for any errors regarding the information displayed on this website.